A year and a decade end, a decade in which I returned to running after nearly fifteen years abstinence. Strictly speaking, since the first decade of this era ran from 1 AD to 10 AD, a new decade doesn't start till the start of 2011, but I think I shall not win that argument. What of 2010? I haven't made my mind up yet. I'll do a spring half-marathon, probably Hastings. Beyond that, I'm not sure. The first run of the year will be at 11 am tomorrow, when I and other Striders will take our hangovers to the Martello Tower. Needing a little more distance, I ran from home to Splash Point, then to Newhaven East pier, and back, the whole being 7.2 miles. The first section, the journey east, was hard work in a stiff, chilly wind, but I love the winter sunsets over the sea. The light lasts much longer than one would expect. I have two runs to recount, a rare but welcome visit to Seaford Striders club night on Wednesday, and a solo three miles on Boxing Day. The Striders were a little depleted, it being Christmas Eve Eve, but there were enough of us to form two groups. The fast group set off to run our winter route in reverse, while I joined the slow-coaches, who ran the route in its conventional, anti-clockwise direction. We met the fast runners in Hillside Avenue, at about the same time as we met Santa's sleigh, pulled through ice and snow by Seaford Rotary Club. We pressed on, past the cemetry, up Barn Rise along North Way, and back by way of Kedale Road and Elm Grove. On Boxing Day, to purge myself, I set off for the three mile Seaford head route. It was hard work, and windy at times. A light shower of sleet fell as I reached the highest point of the route. The ground was saturated and slippery, and I took an oblique route down Seaford Head at the end, in the interests of safety. For my last race of 2009, I chose to enter the Christmas Pudding Dash at Ashburnham Place. The organisers were send encouraging e-mails in the days beforehand, reassuring us that the ground was raceable and that the race was definitely on. The race started at 10.30, so I could stay in bed until 7.30, and then get up for porridge, toast and honey. The journey there was glorious: the sun over the Cuckmere and the frozen hills above it; a few exciting driving moments on the road through Jevington; and the view from the Pevensey levels of the cupolas of the Herstmonceux telescopes, their domes shining as the cupolas of Russian churches must hundreds of miles to the east. At the start, runners milled around, many dressed in Saturnalian costume. My favourite was a nun, though there was also a very convincing fairy. The course consisted of two laps round the grounds, and had been reversed, I understand in the interests of safety. After a children's race had been completed, off we went. After crossing the lake, we climbed a hill. I took a while to find my rhythm,. I have been reading about breathing techniques, and unwisely experimented with some at this stage. They didn't;t work and I found it hard to return to my normal breathing pattern. After the climb, we ran along the top of a wooded ridge for a while, before a descent and a brief run on a road, then returning to the house by the drive. For the da capo, we were sent out on a brief spur to add some distance. By now I had found my rhythm and fought a fierce duel with a fellow runner with a small dog, overtaking the pair on the second ascent of the hill. I am sorry to say they caught me on the way down. The Garmin showed the route as 4.31 miles, rather than the advertised five. With a week to go till the Christmas Pudding Dash, I needed to get some miles in. But, only able to run on Saturday and Sunday, all I could manage was a three miler along the front and back through the town on Saturday afternoon. Sunday came with bright sunshine and blue sky, but by the time I had digested breakfast, dark clouds and a light drizzle had appeared. I set off to run up Seaford Head to the barn, then down into the Cuckmere estuary and up again at Hope Gap. The most taxing feature of the run was the Cuckmere mud. On sections of the path beside the river I could only move forward at tortoise-like speed. Fashion notes: for the first time this winter, I felt under- rather than over-dressed. I have a curious head-band that I only put on when it's very cold. It made me look more than usually ridiculous, but kept my ears warm. Sunday's run was around 5.8 miles. The Garmin's battery gave up after the first half-mile. I arrived at the Meridian Leisure Centre in Peacehaven to marshal for the Mince Pie Ten Mile in heavy rain. I will regret my failure to find my waterproof over-trousers, I thought to myself. But, by the time I had carried goodie bags, bananas and mince pies in, and attached a considerable number of notices to the walls, the rain had finished and blue sky was coming from the west. This curious course combines glorious stretches on the downs with some tedious running around the ugly back streets of Peacehaven. I was allocated a spot at around the two mile point, where the runners emerge from Lower Hoddern Farm. My duties were to stop traffic as the runners crossed. The drivers of the cars and buses were tolerant, with one notable and unpleasant exception. 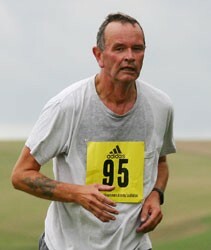 The leading runner, Robbie James of Lewes AC, came through at a cracking pace. 'He'll never keep that up,' said a spectator, but he did and was going just as strongly when he passed me at my second marshalling point, at around nine miles, to win in 59:22. The course was muddy and waterlogged, as the bespattered running kit they wore as they passed me on the way back testified. Marshalling is a fascinating opportunity to observe the wide variation in running styles. I wonder if it is possible to construct a taxonomy of these, based on the variables of arm movement, foot placements, head up or head down, and so on? The great @sweder was among the contestants, and tweeted as he went round, photographing the course at each mile, and has since written a race report on Running Commentary. In the afternoon, though replete with a sailing club lunch, I felt I had to get out and emulate the Mince Pie runners. I went out on the Alfriston Road and over to Fiveways, then across to Bishopstone and back along the sea-front, nearly eight miles. The going was sometimes sticky, but by no means impossible. I ran yesterday and today, for the first time for nearly two weeks. I ran on Friday night, on my return from work after an exceptionally taxing week, yet I found I had the energy for three miles round Seaford, and enjoyed it considerably. It was Christmas shopping night in the town, when all the shops stay open late and a Ferris wheel appears, a new addition to Christmas iconography, at least for me. But while the town was lit up with these vanities, the sea front was quiet, almost deserted and the clouds out to sea dark indigo. Then today I went over Seaford Head towards dusk, in drizzle and a stiff wind. Both runs were around three miles. but I felt so much better for them. I look forward to Christmas: ten days of uninterrupted chances to run.